Arrive Bali airport, also known as the paradise on Earth. Meet and greet by our representative. Once out of the airport, you will see the magnificent statue of a Battle scene between Gatotkacha and Karna. Transfer to hotel ( Check in time 0200PM ) – Rest in the Hotel. 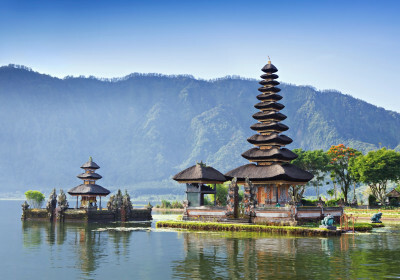 Free time to explore beaches in Bali- OWN. Overnight at hotel. After Breakfast– Transfer for Uluwatu temple – Back to Hotel. Overnight at hotel. After Breakfast visit Full Day Tour: Witness the age old Barong Dance, then into the art village of Ubud –Village (famous with its silver & Goldsmiths jewelry, Wood carving, Balinese Painting and other unique Balinese Handicrafts) etc. Then continue to the spectacular mountain resort of Kintamani the volcano,Having coffee break on the top of the hill while looking out over Mount Batur and its placid crater lake. Drive on to Tampaksiring with its Holy/Healing Temple, return to Hotel & overnight stay..
After breakfast Pickup at hotel, Transfer for Denpasar City : Bajrah sandi monument and puputan square – Transfer for Tanah Lot Temple – Back to Hotel. Overnight at hotel. After breakfast Day free for own activity-Late afternoon transfer to benoa harbour for Dinner cruise by bounty -Transfer to hotel. Overnight at hotel. After breakfast Visit foot of Merapi by jeep 4WD, indian Lunch, visit pine forest, then Parangtritis beach, Dinner at Ganesha Indian resto. back to Hotel. Overnight at hotel. After having breakfast, free program until departure time. The guest will be picked by tour guide directly go to the Airport. End of Tour. In case the water sport company cancels any of the activities due to weather conditions, the guest will be offered a replacement of some other available water sport but there will be no refund as such. As a result, a lot of times Adventure Parasailing is offered as an option on the spot by the water sport company– but of course there is an extra premium attached to it & the guests will be informed accordingly. In case they find that expensive then the Manual Parasailing can be replaced with Donut Boat without any extra premium.